Presbyterian Women invite all women to participate. PC(USA) women's groups have been strong and active since the early 1800s. The Idlewild group recently celebrated its 100th anniversary. Learn more about the history and missions or Presbyterian Women. Idlewild's PW gatherings and lunch are held at the church on the third Tuesday of September, January, and April. Circles meet on the first Tuesday, October 3–May 1, for Bible study and fellowship, except where stated. For more PW info contact Barbara Denley, denleys@bellsouth.net or 901-490-9288, or you can call the church office, 726-4681. APR 9, 2019 : PW Gathering, Installation of Officers and Presentation of New Lifetime Members, includes Lunch. T.K. Young Room at 11:00 a.m. Most circles meet the first Tuesday of each month. The Trezevant Circle meets the first Thursday. For more details or monthly meeting locations, please contact Barbara Denley, denleys@bellsouth.net. Study: God's Promises-I Am With You, by Amy Poling Sutherlun. JAN 22: PW Project Day: Sewing the Confirmand Stoles at 10:30 a.m.
For details contact Katie Cole at katielxs@aol.com. Topic: Experiencing God in Unexpected Ways and Places. Guest Speakers: FEB 5- Judy Johnson, FEB 12 -Suzanne Henley, FEB 19: Sharing within the group, FEB 26: Jeff Thompson. Leader: Katie Cole and Co-leader: Stephanie Rodda. Young Adult Women Questions: Contact Elizabeth H. Doolin. Young Adult Women’s group meets regularly for dinner and study. For information contact Elizabeth H. Doolin. 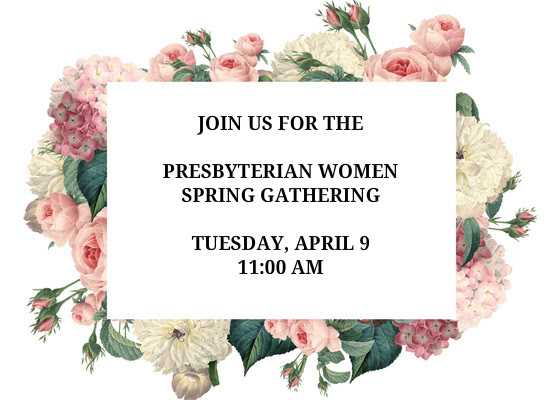 Women and men are invited to the spring Presbyterian Women Gathering and Luncheon, which includes induction of new officers and the Lifetime Membership Awards presentation. Please RSVP for lunch by calling the church, 901-726-4681. YAW meets monthly for Bible study on various topics at different members' homes. The group also meets for dinner each month. Contact Elizabeth H. Doolin, edoolin@idlewildchurch.org for more information. ChristCare groups are small communities of people with a common interest and a dedication to support, pray and study together. Two below are designed for women. Click here to see all ChristCare Groups. Pot-luck social on 4th Wednesdays in members' homes. Contact Jenni Brooks, jbrooks@idlewildchurch.org, if you are interested in joining. Monthly meetings in members' homes. Contact Anne Bradley Thomas, ab29thomas@yahoo.com. Tuesday, JAN 8: Leader, Carol Seamons/Host, Margaret Fraser, 153 Harbert Ave, 38104.